I using this for setting the Emission color of a material where the HDR combined with a camera's bloom effect creates a glow. Its not perfect because the color picker in the action behaves differently than the material's, but at least the brightness isn't clamped to 1. 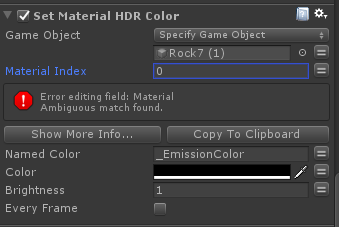 Using the SetMaterialColor action doesn't work? if you use '_EmissionColor' as the namedcolor property? That's very good. thanks for the information. Is it just the emission color that is affected? Hm, not sure. Any HDR color I guess, though emission is the only one I know of. Ok. Care to put it on the Ecosystem? I can do it if you don't think you'll be making more actions. I never put time into learning how to do that, I'll look into it! Ok, it's on the Ecosystem now. Can you provide a sample project? I can't reproduce, I must be missing something.